Cairo, 5 March 2015 - Women ministers and leaders from Africa meeting at the Africa Ministerial Conference of the Environment (AMCEN) launched a new network, Thursday, that aims at enhancing representation and involvement of women in decision-making in areas related to the environment and sustainable development continent wide. The newly established African Network of Women Ministers and Leaders for the Environment will lead the development of an AMCEN policy on gender and the environment designed to mainstream gender and environment considerations into development planning, legislation, and financial policies at the regional, national and community levels. The network is co-chaired by Madame Zanou Armande, Director of Environmental Law, Ministry of Environment, Benin and Madame Hadijatou Jallow, Executive Director, Environment Protection Agency, Sierra Leone. “This comes at a critical moment as the world prepares to adopt a new a Post-2015 Development Agenda and Sustainable Development Goals and just months ahead of the UN Conference on Climate Change. Implementing such agreements will only be made possible with the meaningful streamlining of gender policies across international frameworks and national development plans,“ he added. The African Network is a chapter of the Global Network of Women Ministers and Leaders for the Environment, established in Helsinki in March 2002. Executive Director, Office of the President for the Environmental Protection Agency, Sierra Leone, Haddijatou Jallow said, "The Network of African Women Ministers and Leaders for the Environment provides an essential platform to advocate for enhanced support for women, as they comprise the majority of users of our natural capital and are more vulnerable to adverse impacts on our environment". Director General for the Environment, Ministry of Environment and Protection of Nature, Benin, Zanou Aivohozin Armande said, "One key role that the Network African Women Ministers and Leaders for the Environment will play is to apply a multidimensional approach in addressing emerging gender issues in environmental management. In doing so the Network will bring together women and men from different walks of life, be it academia or farming- without any bias - to develop strategies or solutions to address environmental degradation. As the UNCCD focal point for Benin, I also feel its important to empower women to be key players of sustainable management of the environment and not only as victims of degradation." The Global Network (NWMLE) was created to address the critical need for visionary and concrete policies toward sustainable development worldwide. The overall objective of this network is to improve the representation and involvement of women in decision-making regarding environmental issues based on the belief that women, who have primary responsibility for raising children and securing sufficient resources to meet their families’ nutrition and health needs are the ones most affected be environmental degradation. 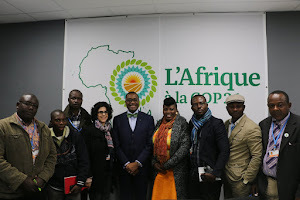 The Africa Network will develop recommendations for practical solutions to environmental problems at the national and regional levels; build network partnerships with appropriate civil society, non-governmental and intergovernmental agencies; exchange best practices and experiences in order to implement more effective policies and create a critical mass of leadership to influence international and national policy.